FARMINGTON — As season openers go, there was plenty to like and plenty that left a little to be desired. 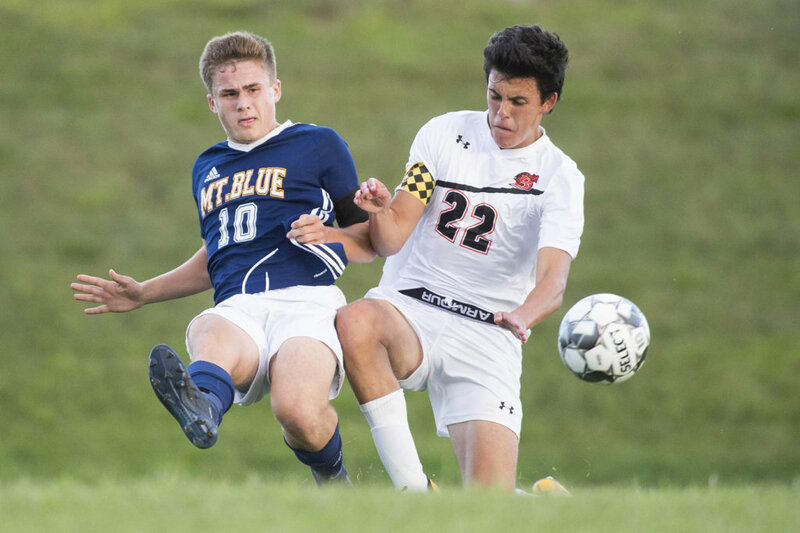 Ninety minutes wasn’t enough to settle the difference Thursday night at Caldwell Field, and Mt. 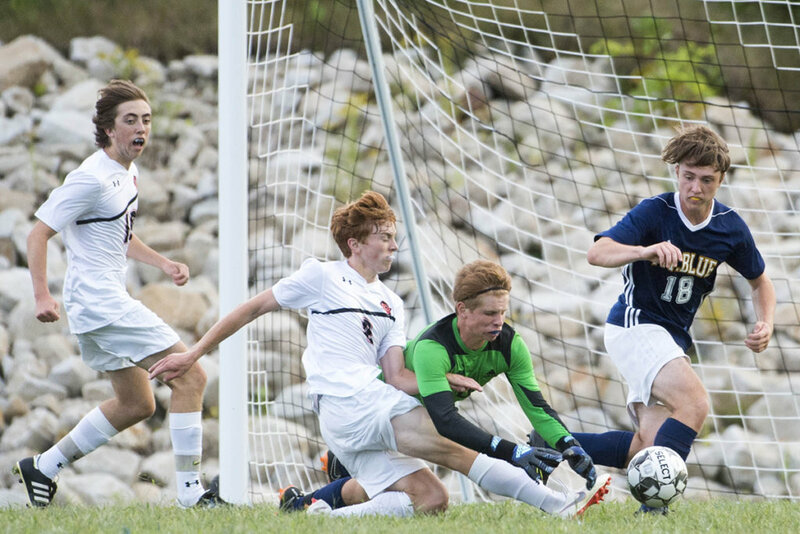 Blue and Brunswick split the points in a 2-2 Kennebec Valley Athletic Conference Class A boys soccer draw. Mick Gurney scored both goals for the Cougars, who surrendered the tying goal off the foot of Dragon Lane Foushee in the 44th minute. “That was pretty good, huh?” Brunswick coach Mark Roma said. Mt. Blue was the better side for much of the first half, controlling the midfield and looking extremely confident in possession throughout the 40 minutes. 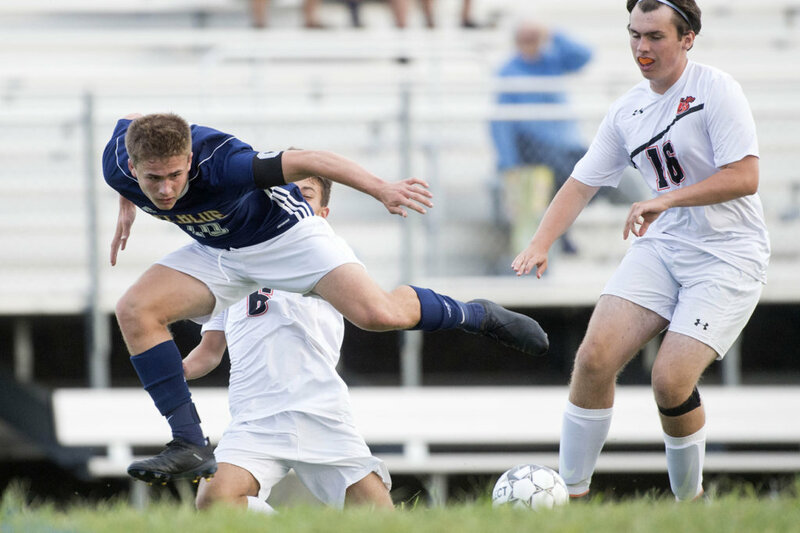 The senior Gurney opened his account for the season with a solid strike in the 19th minute that gave the Cougars a 1-0 lead, after Sam Smith did much of the work to gain control of the ball and draw the defenders before laying off to Gurney just inside the top of the 18-yard box. Smith was hauled down from behind less than 20 minutes later to earn a penalty kick. Gurney took the spot kick and deftly buried it with a low shot inside the left post. But the road to an opening victory for the Cougars hit its first obstacle just two minutes later. A poor clearance on a Brunswick service into the box allowed a follow-up shot, one which clunked off a Mt. Blue defender and into the net for an own goal. From there, Brunswick had the momentum, and the Dragons came out after halftime to produce Foushee’s equalizer in short order. While much of the final 20 minutes of regulation did little to inspire, the 10-minute extra session provided brilliant moments from both sides. None was better than Brunswick senior Emmet Taub’s in the final 30 seconds of play. Taub stood over a free kick from the right side and barely 25 yards from goal, curling a sizzling strike toward the top near corner. It forced a splendid diving save from Mt. Blue’s sophomore keeper Xander Gurney (eight saves). The Cougars had moments of their own to walk out with a golden goal in extra time. 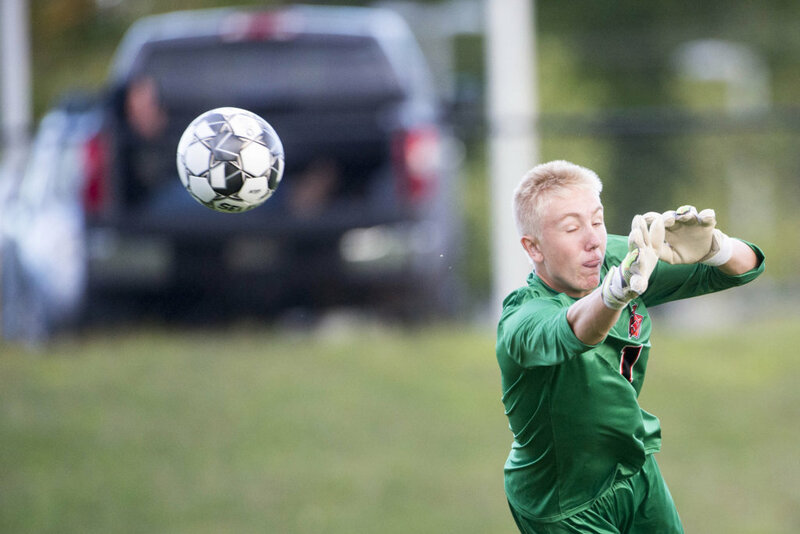 In the 82nd minute, Josh Smith’s crack from 20 yards just squirted wide of the left post, and in the 84th minute Chris Marshall’s drive through traffic was turned away by Brunswick keeper Liam Hemberger (eight saves), who hardly had enough time to locate the ball before punching it with two hands clear of the area. Where Mt. Blue had played the game it wanted in the first half — and for part of the extra session — it was Brunswick that looked more comfortable after the break. Where the Dragons had no time in the midfield early in the match, they found success with long balls to break apart the Cougar midfield in the second half. That led to more time on the ball for Brunswick as the game grew late, and the Dragons used that time to find a way to get the draw.